Out with the old, in with the new. I've been busy tying up loose ends for a fresh start in the new year. As I get ready to ring in another year, it's a good opportunity to pause and reflect on the outgoing year. It was a busy, inspiring, eventful year for Dirty Water DyeWorks. 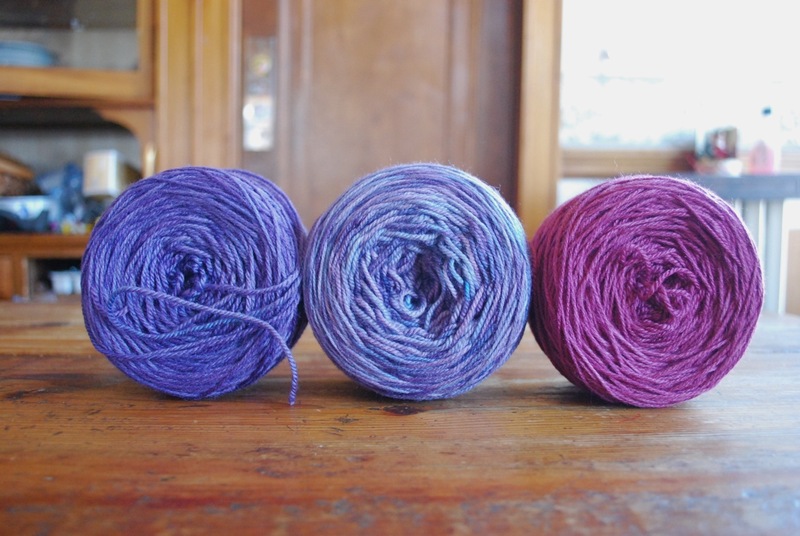 From Sock Summit to Rhinebeck and everything in between . . . it was fun to meet so many of you in person at events in New England and beyond. The 2012 calendar is filling up, and it promises to be another year with plenty of travel and adventure. 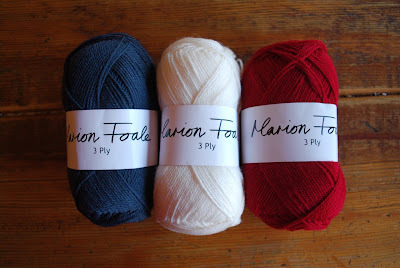 New yarn lines will be offered in the coming year along with fresh colorways and kits. Some items will be retired to make way for the new. It's all part of the process. In business and in life it's often good to cast your net wide. There's a certain thrill because you never know what will come back. Sometimes there are disappointments, often times there are surprises. And there's always the challenge to make the best of the situation and move forward. I'm reminded on a daily basis that inspiration can be found almost anywhere - even amidst the junk mail. Best wishes for the new year and the challenges ahead. This week between Christmas and New Year's Day isn't a vacation week for me. I have plenty to do, but I am working at a relaxed pace. In addition to a little dyeing and a lot of paperwork I'm concentrating on knitting the last of the holiday gifts. The other day I spent time plotting and planning a cozy, colorwork hat. This was going to be a fun, entertaining project. Then I hit a snag. I did the numbers and realized that I didn't have enough yarn. It turns out the recipient would rather have Pop Up Paws instead, and I have the yarn ready and waiting. That was an easy fix. And I've been knitting away on these almost mindless fingerless mitts. I finished one in no time at all. Without giving it a thought I cast on the second one. This was going to be a snap. 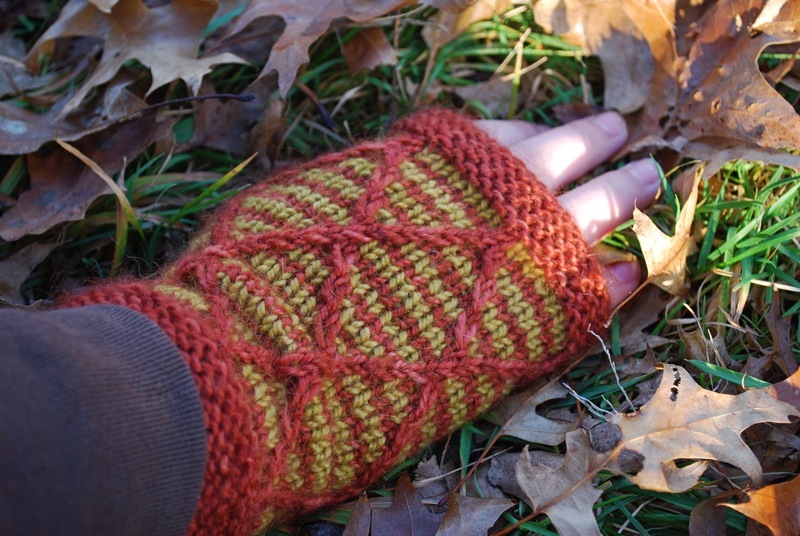 I was going to hand over these mitts and cross another gift off my list. Then I hit another snag. Yes, I ran out of yarn. 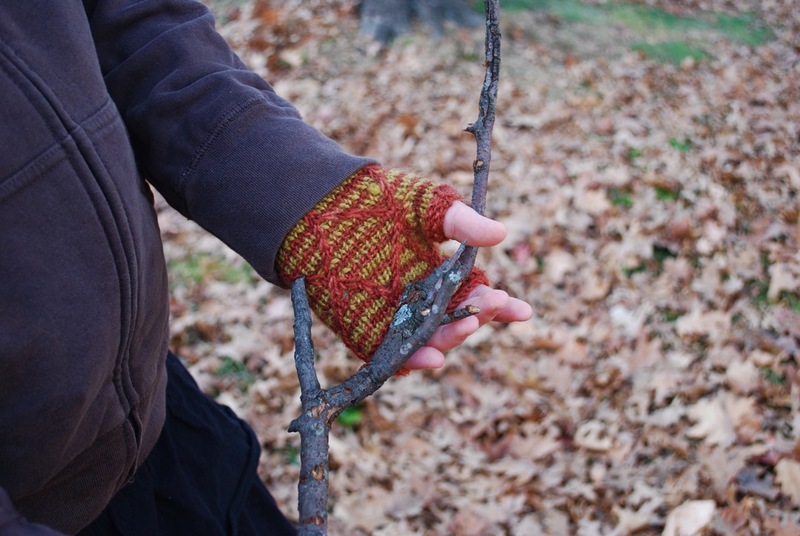 I'm so close - all I need is enough yarn for 10 rounds on the hand and a bit of a thumb. 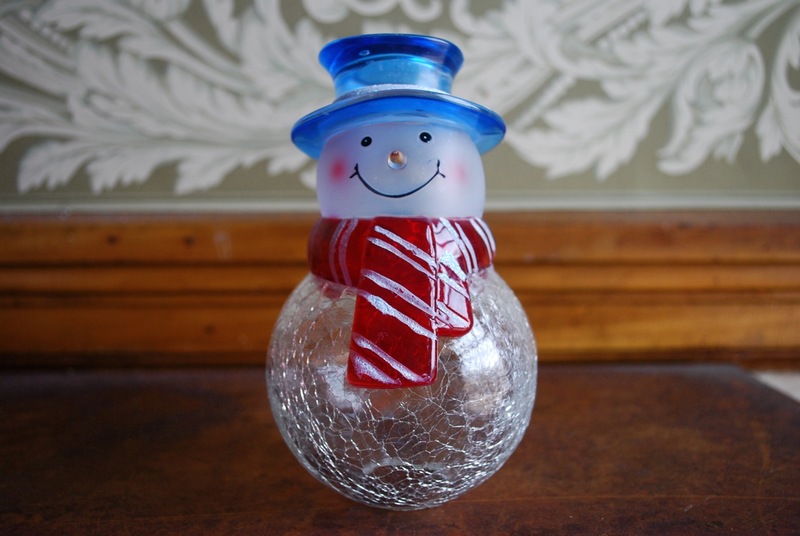 I convinced myself that one ball was going to be enough, but I should have known better. 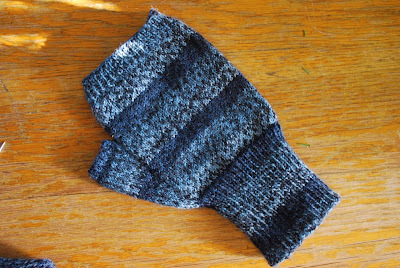 These mitts are for my son, and he has huge hands - hands the size of my forearm. I have another ball of this yarn. 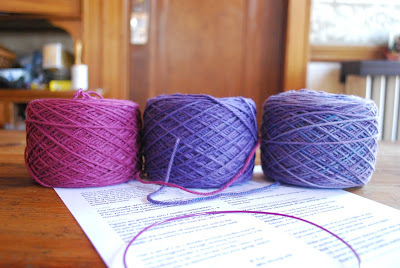 I think I have another ball of this yarn. Later today I'll be stash diving to find the other ball. Or a close substitute. In the blink of an eye the Christmas holiday has come and gone. All that planning and preparation requires a certain amount of fortitude, perseverance and focus. Hours and hours of work - and then it's over. It was an enjoyable holiday. I woke this morning with a huge feeling of relief. Now that the I don't have holiday planning on my plate, I have a flood of ideas for new knitting projects. All those patterns and yarns that I had to tuck away have suddenly surfaced. Dye pot experiments with new yarns and colors are calling. 'Tis the season to be jolly. It's also the season to be frantically busy and crabby. 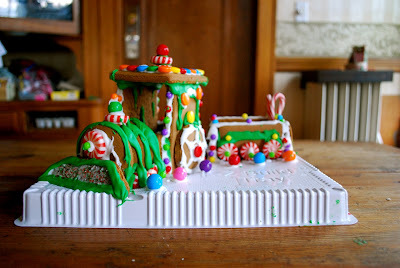 In an attempt to reduce the stress of the holidays I've let go of unrealistic expectations. Instead I'm focusing on the simple things that matter. 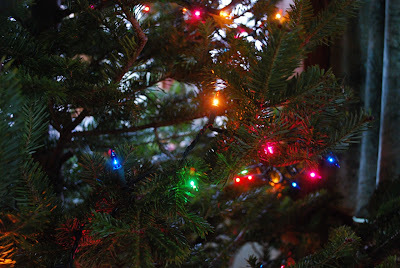 The tree is up and decorated with lights. We'll hang the ornaments either today or tomorrow. 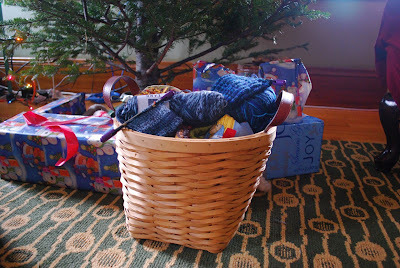 My basket of holiday knitting is still overflowing. I've already warned recipients that they'll get their gifts when they are finished. Note that I haven't done any wrapping. The gifts under the tree came in the mail. The kids and I have done a lot of baking. 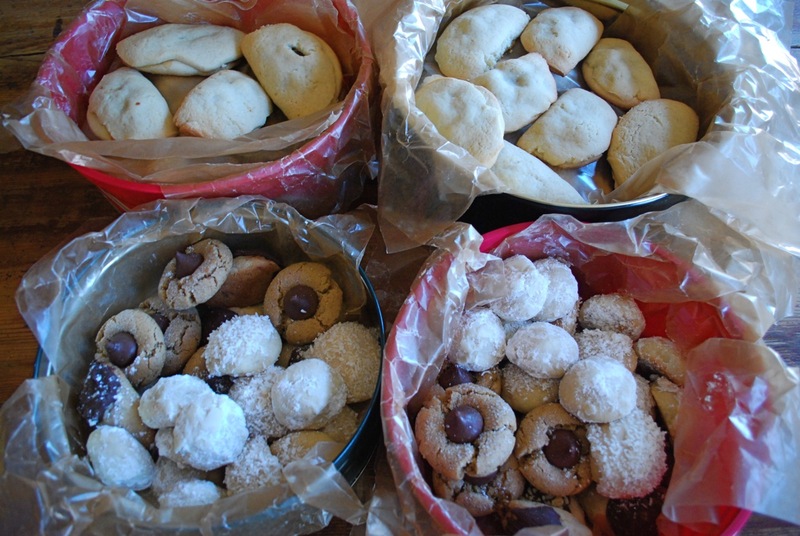 Now that we've gifted all of these, we need to bake more for ourselves. 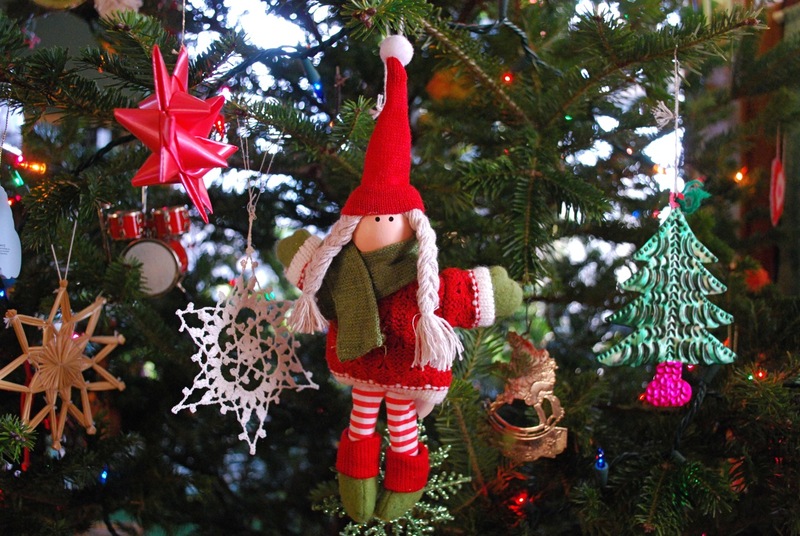 Today I'll enlist the help of elves for the wrapping, baking and decorating that still needs to be done. 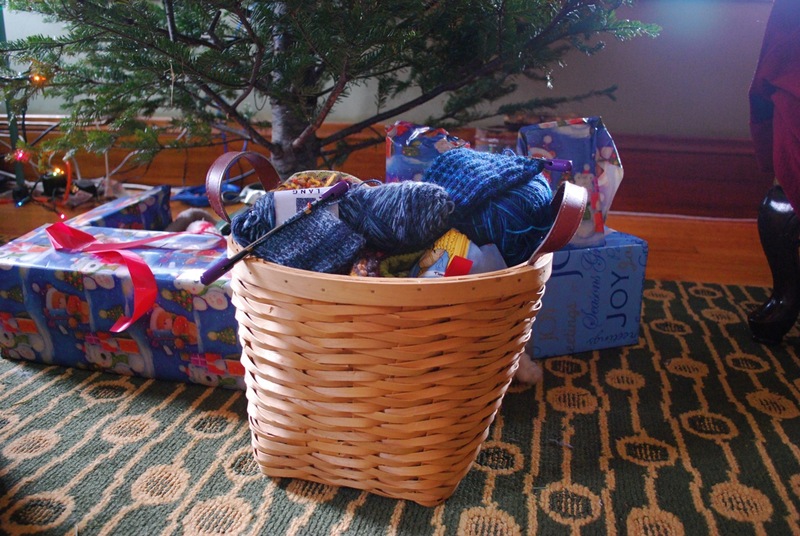 And I'll give myself time with that basket of knitting. 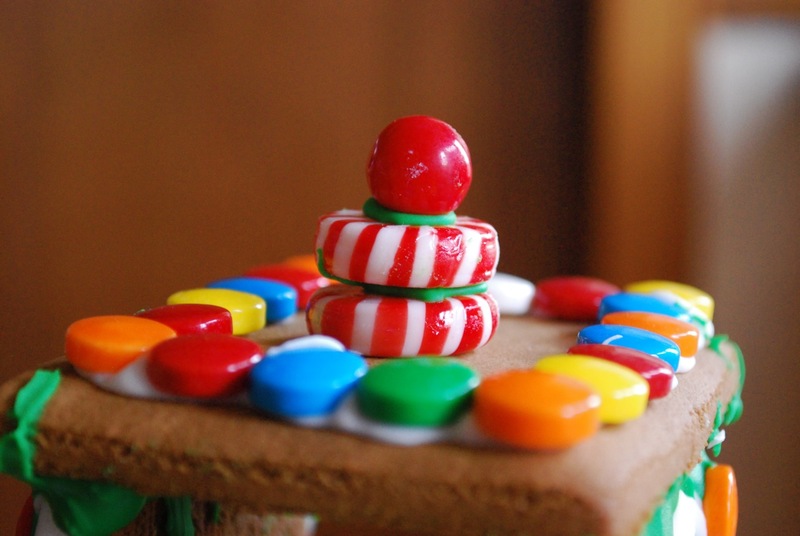 The sights and sounds of the holidays have plenty to offer in the way of color inspiration. 'Tis the season. For those who observe the holiday, may you have a meaningful celebration. Winter solstice is upon us. Darkness. The long night. I celebrate these dark days by lighting many candles - warm, cozy light to chase away the shadows. 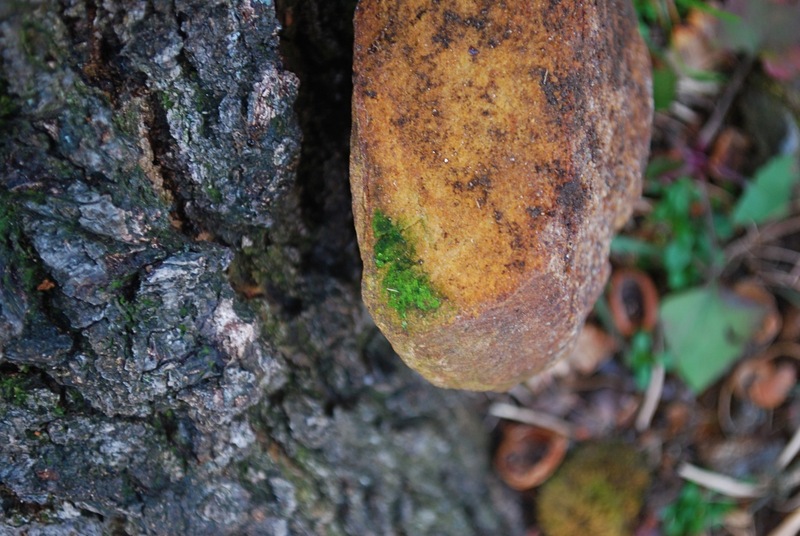 Marking the winter solstice is a ritual of hope - hope that the sun will return and the daylight will grow longer. I am usually full of hope. While I no longer have hope that these socks destined for men's size 12 feet will be done in time for holiday gifting, I do have hope that some day they will be finished. And I have hope that the light will return and the cycle of seasons will continue. Embrace the dark for out of the dark comes light. 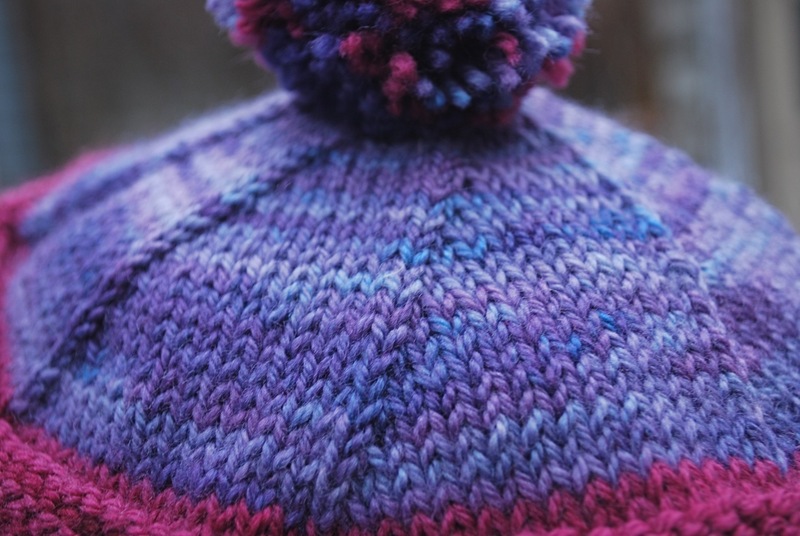 If you're in the process of knitting holiday gifts, you may be at the point where it's time to abandon more elaborate items in favor of a quick project. Set aside the complex Fair Isle sweater and the intricate lace. What you need is something that you can finish before the holidays. 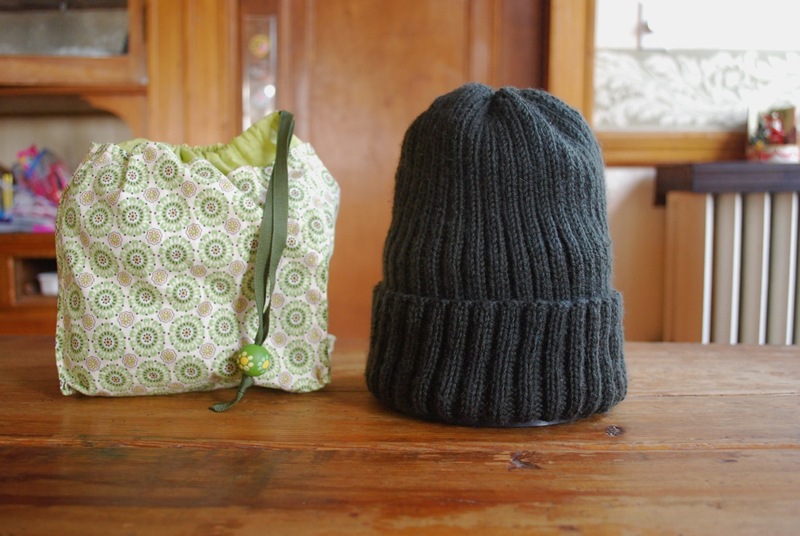 A hat is often a good solution in situations like this. I opted for the basic 2 x 2 ribbed hat. The pattern is mind-numbingly simple - knit 2, purl 2. 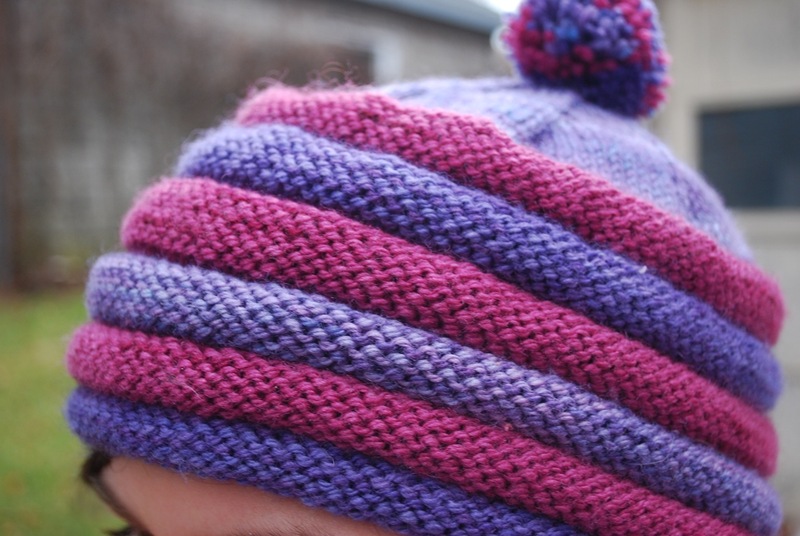 I must admit that the other night I found this easy stitch combination a bit challenging. I blame it on my sleep deprived state, the hockey game I was watching or both. In any event I got back on track and finished without any problems. I can cross off another gift from my list. You can find patterns for similar hats here and here. Carry on with your holiday knitting and don't give up hope. It's still early in the week. 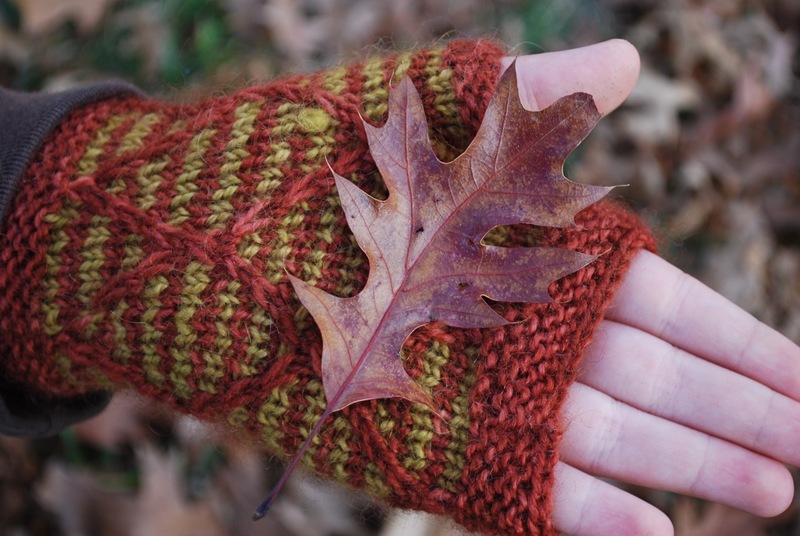 It's that time of year when I have a crazy number of knitting projects in the works. I should spend each and every waking moment with needles in hand. If there were knitting police, they would hand me a ticket for knitting to the point of no return. Every project I complete is an accomplishment. Plus it frees up another pair of needles. This design is the work of Lucy Neatby. Her well-written, thorough patterns never disappoint. 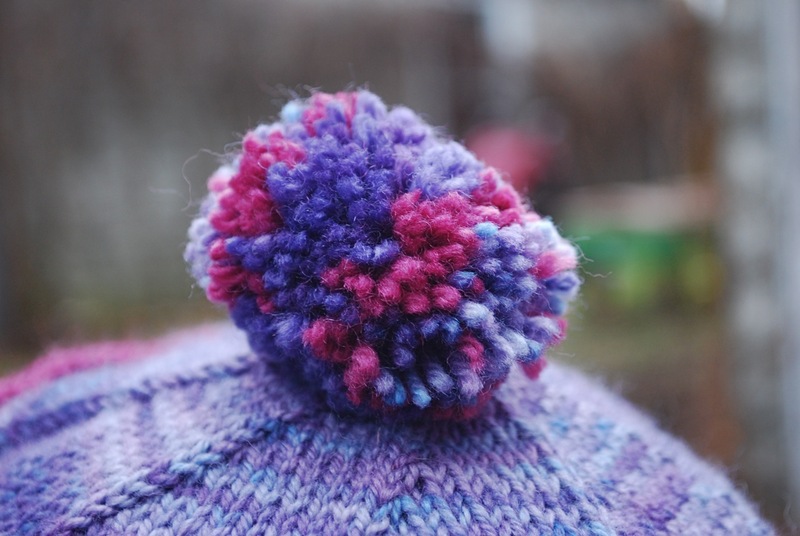 Scrunchie includes instructions for a variety of sizes and different weights of yarn. There's even a headband version. And there are options for endless color combinations. 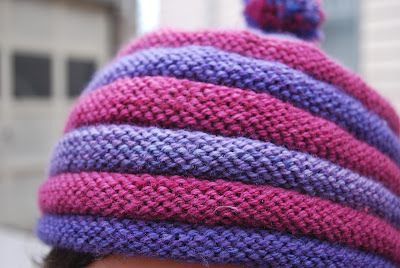 Or a solid colored hat if that's what you prefer. 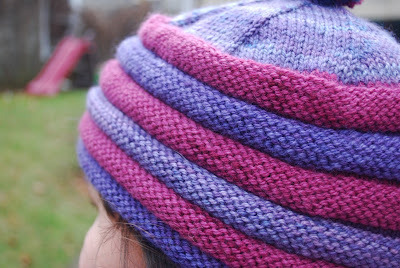 I'm already thinking of color combinations for my own hat. 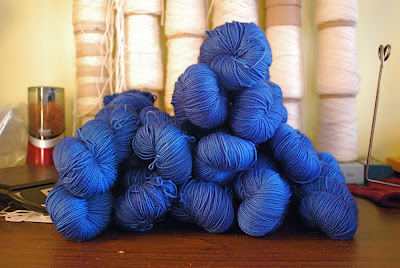 The yarn is Dirty Water DyeWorks Edna. 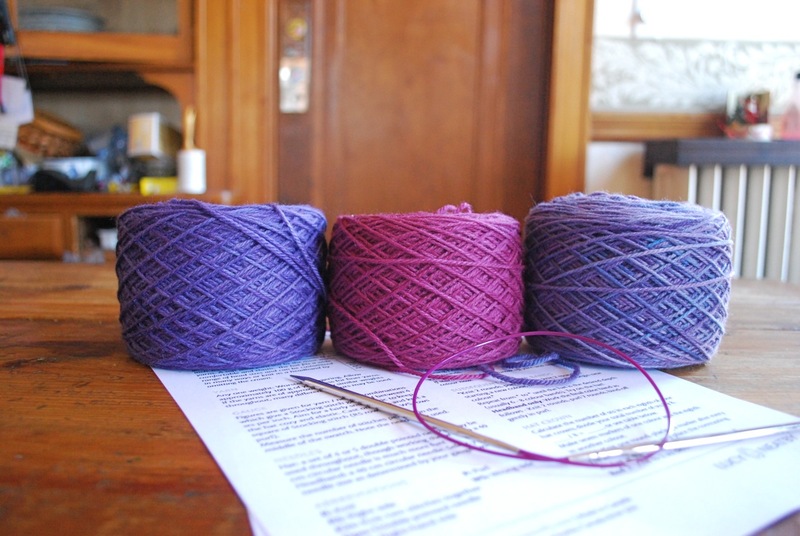 Edna is a Polwarth / Silk blend that produces rich, subtle color variations. It's a treat to work with. 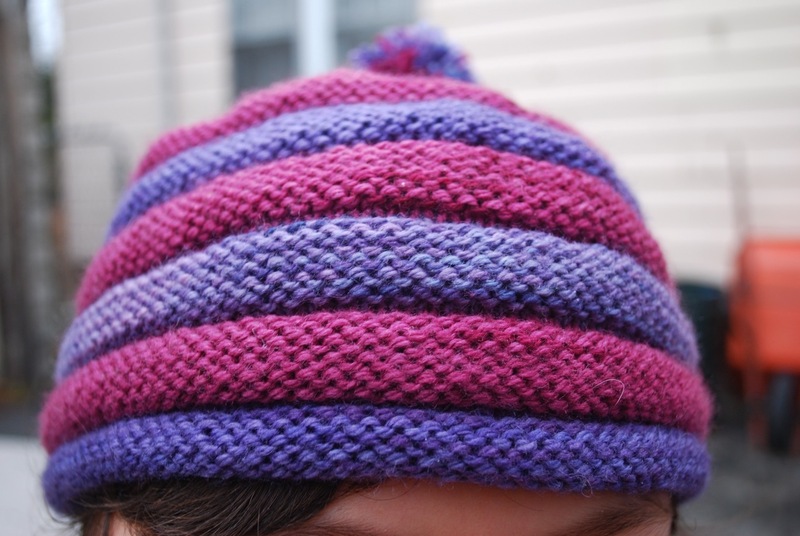 The pattern includes several finishing options for the top. I couldn't resist the colorful pom-pom. The weekend is upon us. If you're holiday shopping in the Cambridge / Boston area, check out the Handmade Holiday Show tomorrow (Saturday) at Gather Here. It's a great opportunity to buy local and handmade. Often the color that stands out is the one that grabs your attention. My color inspiration for the week looks even more vibrant in contrast with the surrounding earth tones. We've been making the rounds of the holiday party circuit where there's an abundance of festive food, laughter and good company. 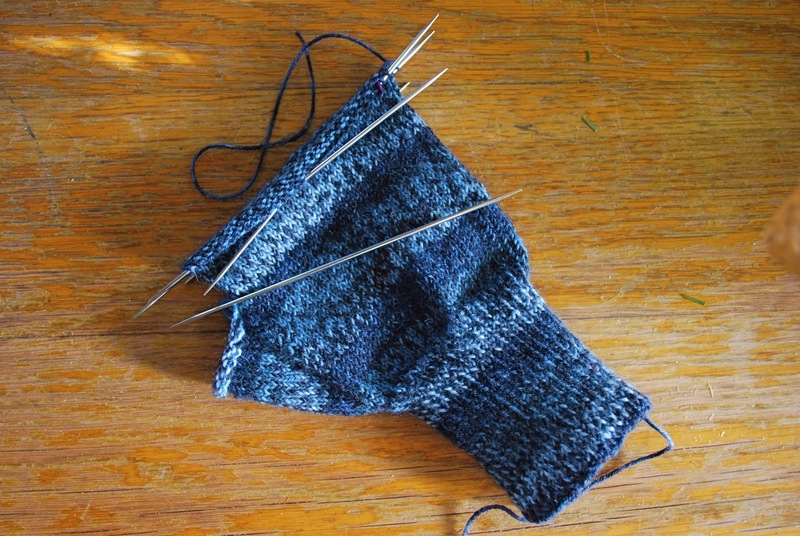 All of this merrymaking is great fun, but it definitely cuts into my knitting time. 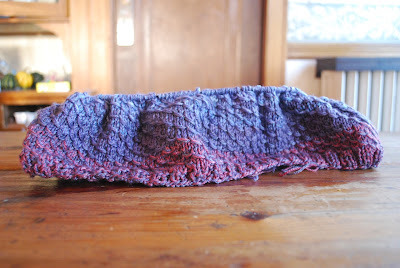 The almost-finished Scrunchie Hat. It's in a holding pattern, waiting for the crown. There's a yarn queue forming. In other news gift certificates are now available in the shop. They are perfect for holiday gift giving and other occasions. The best part? You don't have to go to the mall to get them. I'm not quite sure how we landed on Monday again, but here we are. 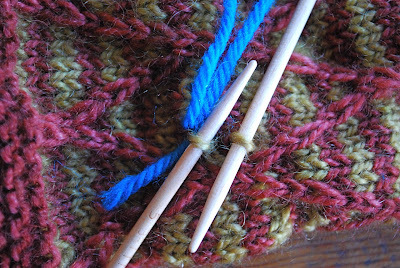 I have knitting to share, but alas, there aren't any pictures. Yes, it's definitely Monday. 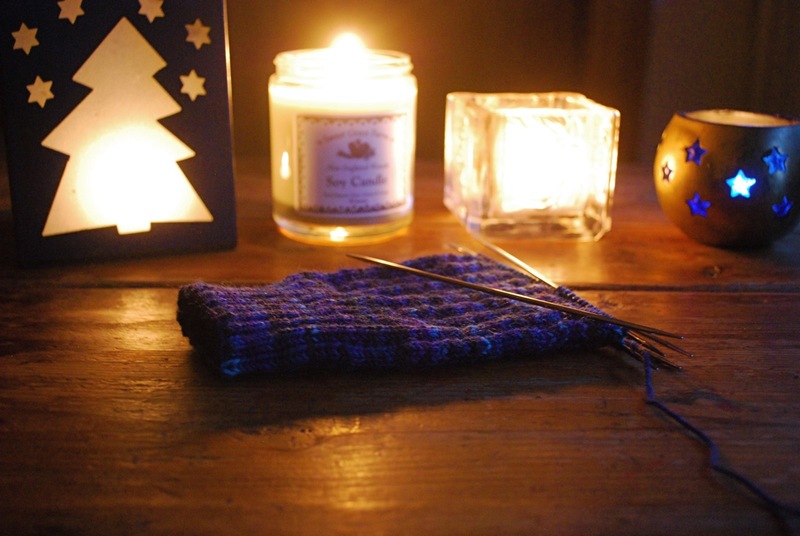 The knitting will keep for another day. Instead today is a good day for a bit of . . .
~ Check out these intriguing pictures of shepherds on stilts. Click on the pictures to enlarge. As if getting around on stilts isn't enough of a challenge, note that some of the shepherds are knitting while on stilts. The sheep graze on bog land, and the stilts keep the shepherds out of the muck. Personally I would have opted for a good pair of boots. You can read more about it here. ~ Speaking of sheep if you need a holiday gift for a knitter, you might want to consider the sheep gift from Heifer International. Easy online shopping and a good cause all rolled into one. ~ Looking ahead to 2012 the top color of the year will be Tangerine Tango. The attributes of orange are vitality, urgency and strength. We can use a healthy dose of all three in the coming year. ~ Finally, paper snowflakes. 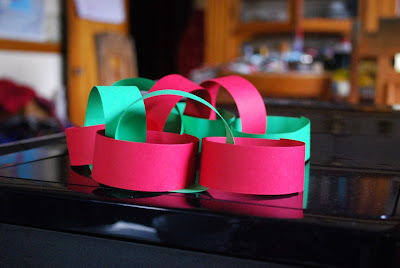 It's that time of year when I like to pull out paper and scissors. Cut, cut, cut. If you need inspiration, take a look at these beautiful flakes made from junk mail. 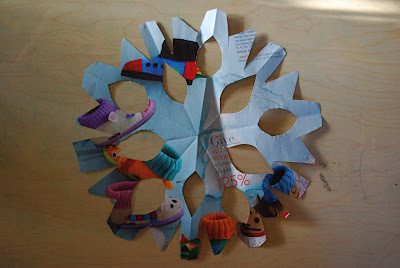 And if you don't have time to take scissors in hand, virtual paper snowflakes may be just the thing for you. 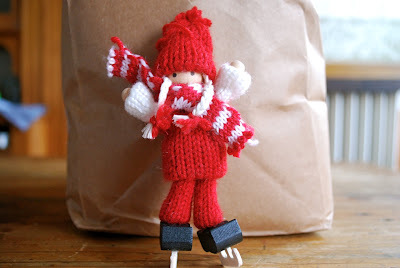 I've been working on holiday knitting. At this point in the game I have more good ideas than actual finished projects. I have a plan for these three, and it involves combining them in a particular order. Any order will do. There's no right or wrong, but I'm stuck. This has a nice flow. This one has a certain appeal. But then again, so does this one. I've been playing around with these combinations for too long. It's time to make a decision. 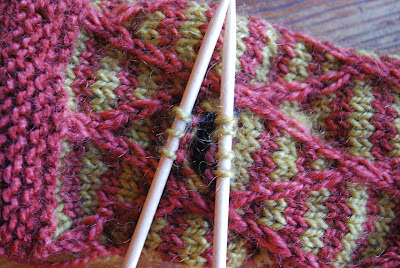 After all of this back and forth, the actual knitting will be done in no time. We are surrounded by color each and every day. Sometimes it takes a unique contrast in colors to get our attention. 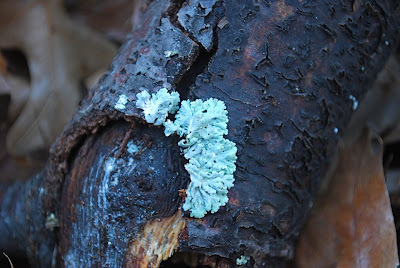 So it is with my color inspiration for the week - minty green against bark brown. I have a new pair of mitts. 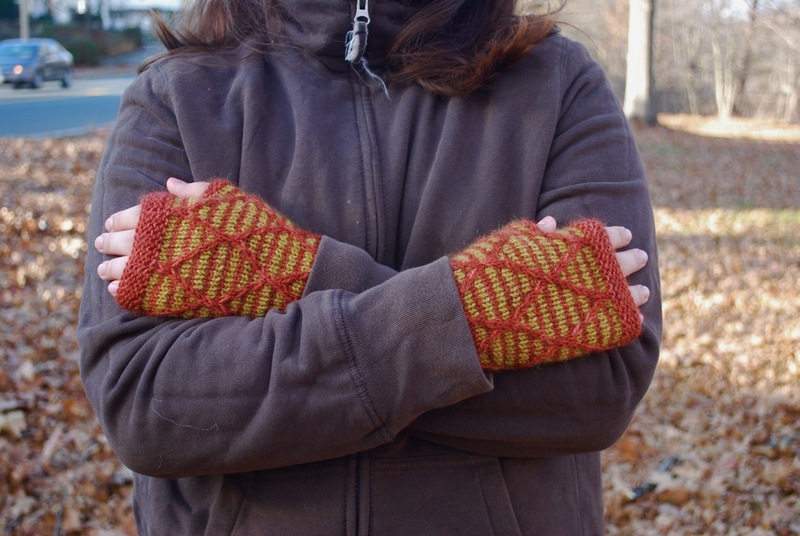 Diamondback Mitts by Stephen West. I enjoy designs from Stephen West. He features some creative constructions and has fun with shapes and angles. 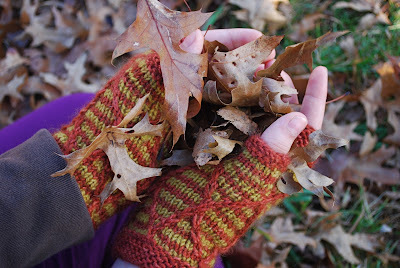 These mitts are no exception. A simple cable and a few slipped stitches create the diamondback pattern. Only one color is worked at a time. 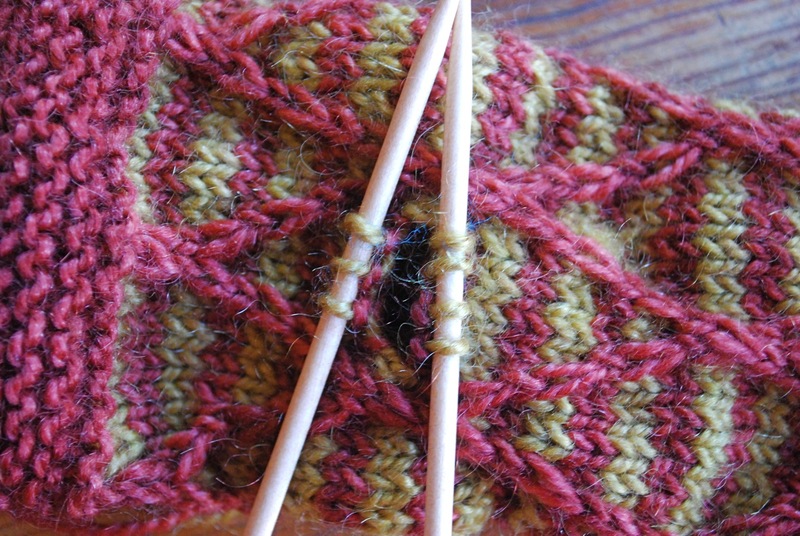 With color changes every two rows, it's easy to keep track of the colorwork pattern. 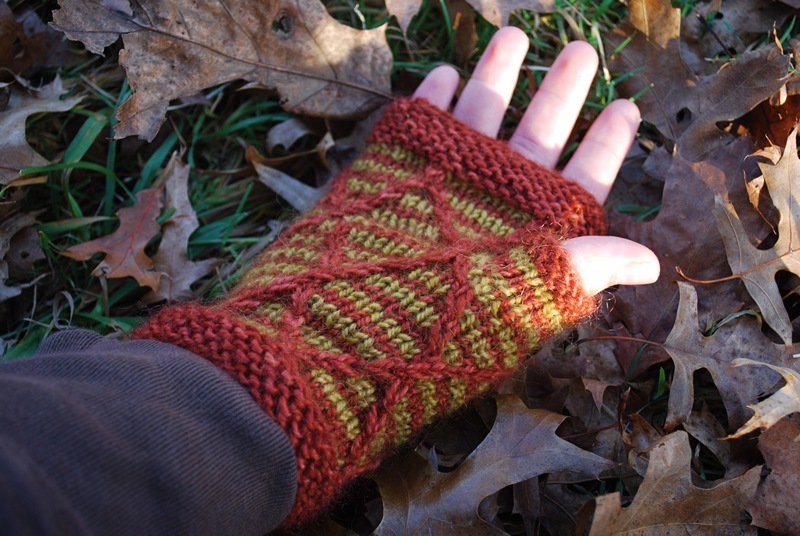 The thumb flows naturally from the diamondback design. Two of the diamondback lines form a built-in gusset and nestle the thumb. 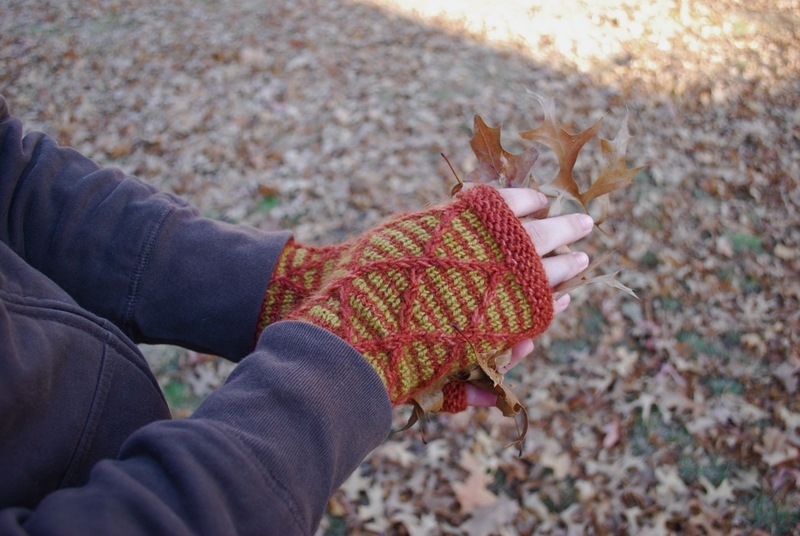 The pattern includes options for different sizes. 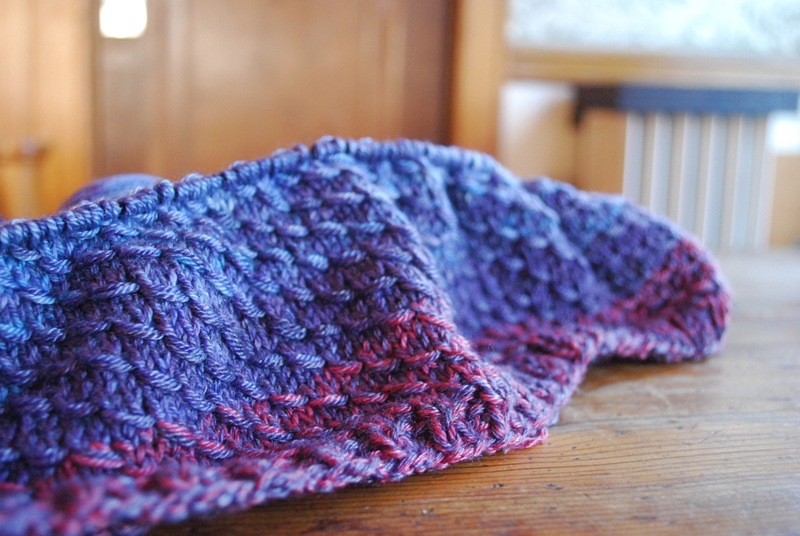 The yarn is a wool / mohair blend - soft and silky with a subtle halo. Currently Dirty Water DyeWorks offers this blend only at festivals and events. I think it might be time to offer it in the full lineup. My track record for keeping mitts isn't very good. I've scattered more than my fair share across New England. I hope this pair will help me break that cycle. My Diamondback Mitts are off the needles, and I'll have shots of the finished product in another post. 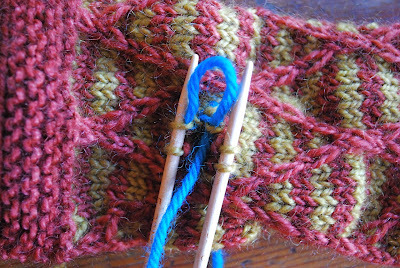 While I was working the thumb, I took pictures of the thumb in progress. There are many ways to make a thumb. This pattern uses the following thumb construction. 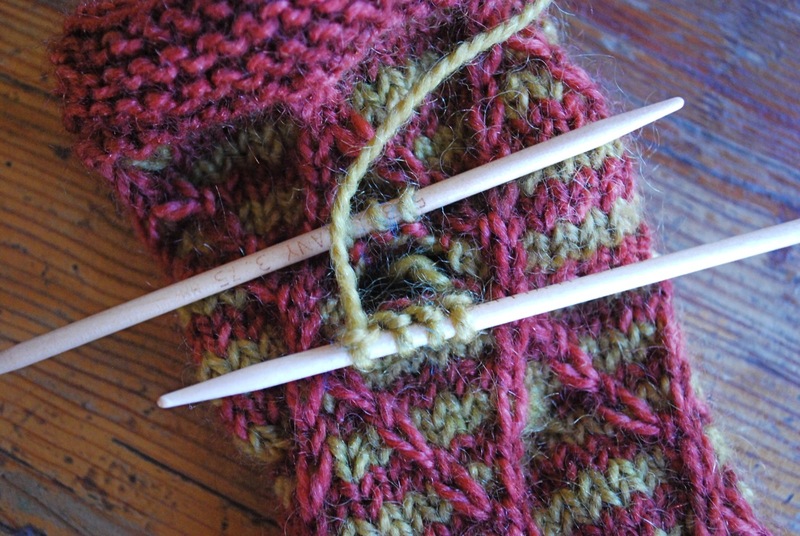 Elizabeth Zimmermann calls this the thumb-trick in her Knitter's Almanac. Knit 4 stitches with contrasting yarn - that's the bright blue above. After knitting those stitches, put them back on the left hand needle and knit them again with the working yarn. Note - if you're working with finer yarn, you'll probably need to increase the number of contrasting stitches. Continue to work the rest of the mitt. After the mitt is finished and off the needles, it's time for the thumb. 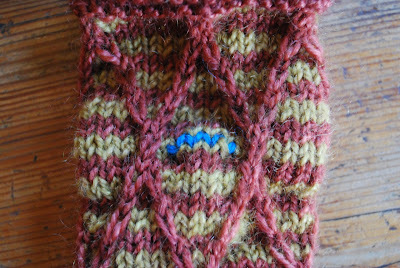 The blue strand marks the spot where the thumb will be. 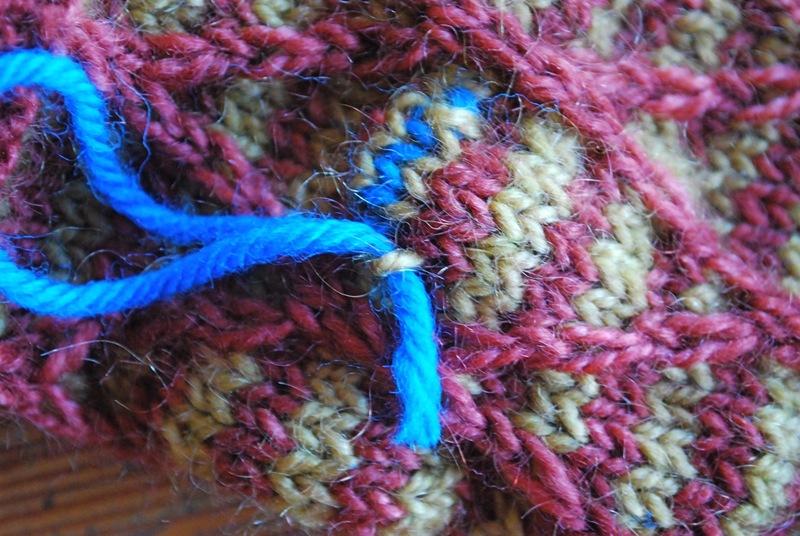 Open up the thumb hole by unraveling the blue yarn and exposing live stitches. 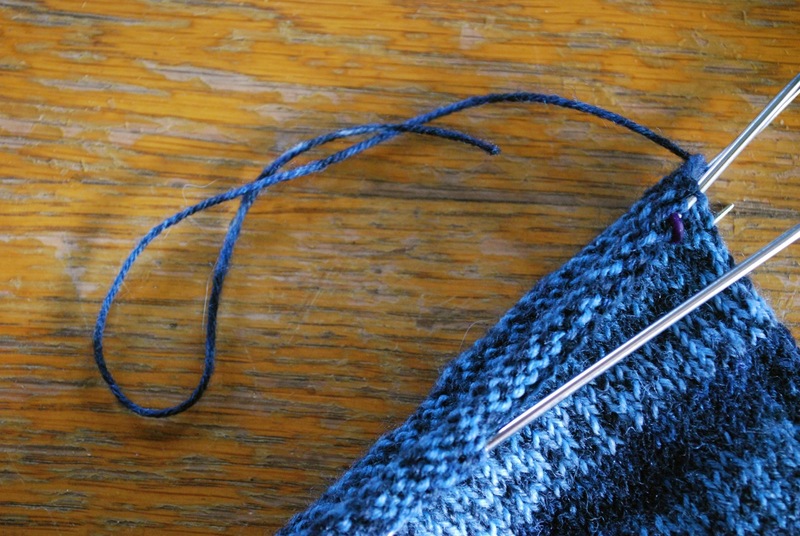 Put the stitches on needles right away. If the stitches get away, it can be messy. 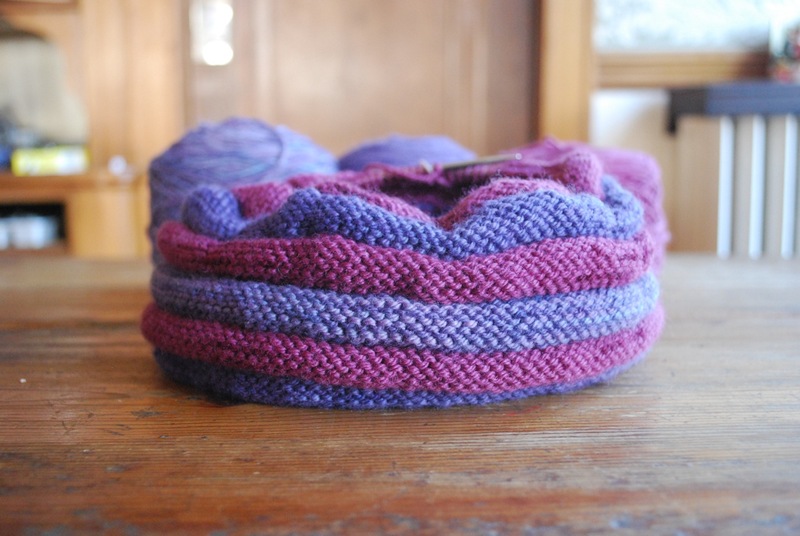 Keep unraveling until the contrasting yarn is free. After all the unraveling there will be two sets of stitches and a thumb hole. For this thumb there are 3 stitches on one needle and 4 on the other. 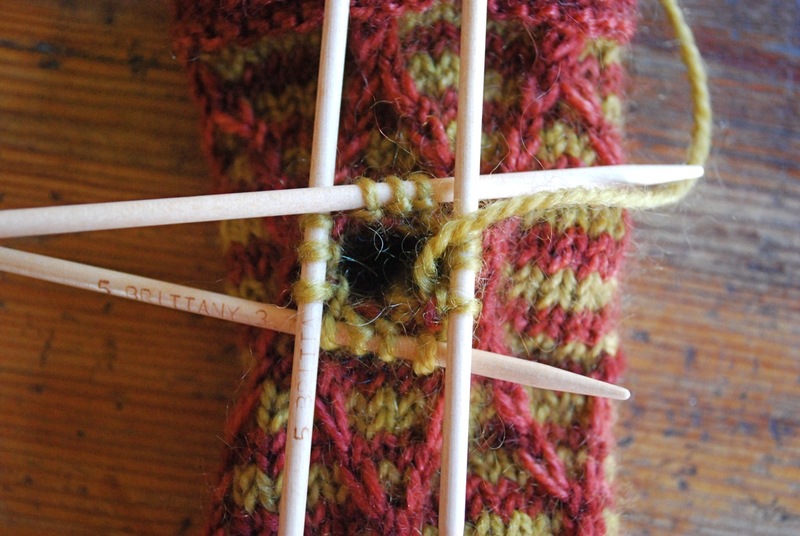 Due to the way stitches are constructed there will be an odd number of stitches after removing the contrasting yarn. 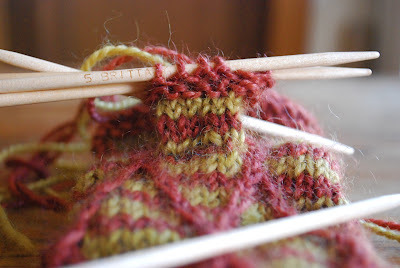 Knit across the stitches that will make up the bottom side of the thumb. Pick up stitches in the gap between the two needles. 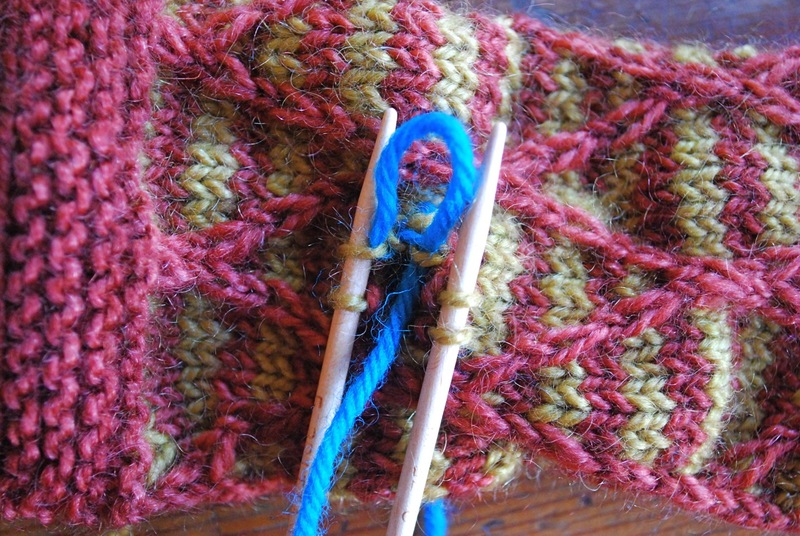 Knit across the top set of stitches and pick up stitches in the gap on the other side. Stitches all around, ready to become a thumb. All that's left is to work the thumb. This thumb is done, ready for a bind off. Remember the thumb-trick, a quick and clever technique. I've been focused on the dye pots. Blue, blue and more blue. 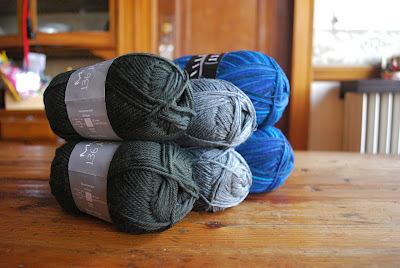 While I've been immersed in blue, my daughter started a new knitting project. Dipped Infinity Scarf, the purple version. At first I think she asked me to make it for her. When she realized it would be along wait, she took matters into her own hands. She has a very independent, do-it-yourself attitude. The scarf is coming along nicely, and she is thrilled. Maybe I'll ask her to make one for me. For several months now I've been attracted to all things yellow - from bright to mellow. Maybe I'm storing up visions of the sun as we head into the dark days of winter. 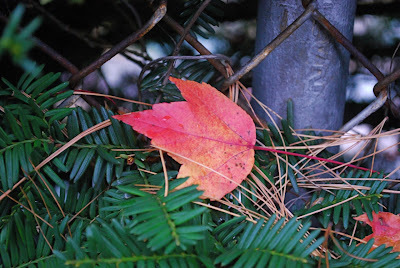 There's even a hint of it in my color inspiration for the week. The other day my daughter and I were in a local store, and she persuaded me to take a look at the Christmas aisle. You know which aisle I mean. The aisle full of all things Christmas from candy to candles to lawn ornaments. 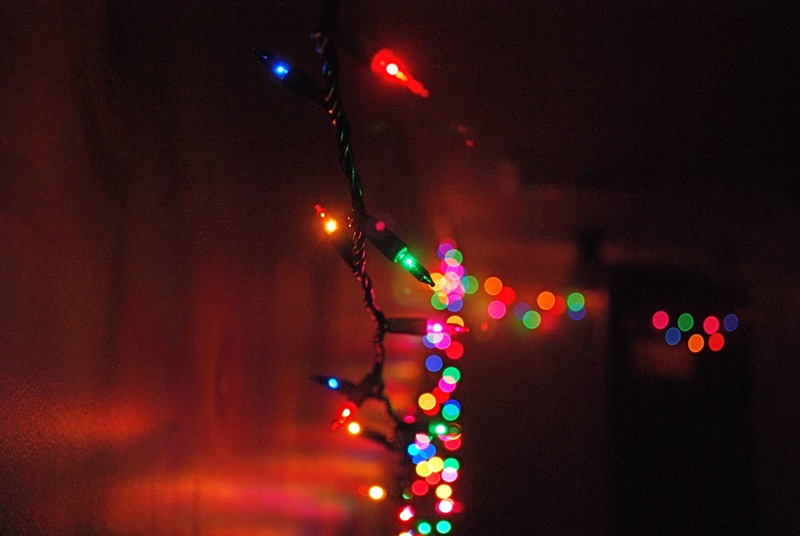 The aisle with enough lights to light up Times Square. We strolled down the aisle, laughing at some of the silly things designed to celebrate the season. We decided that all we needed were some lights when my daughter made a discovery. She found a bit of magic tucked away at the back of a shelf. Ice skaters. 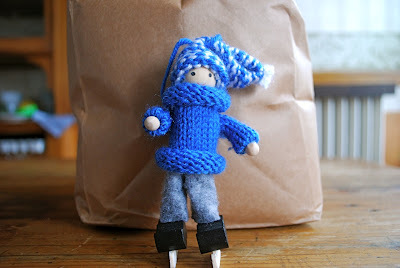 Ice skaters wearing handknits. Ice skaters all warm and cozy in woolly sweaters and hats. They made my day. These skaters are meant to be tree ornaments, but for now they'll be keeping me company at my desk.